Save the Date! 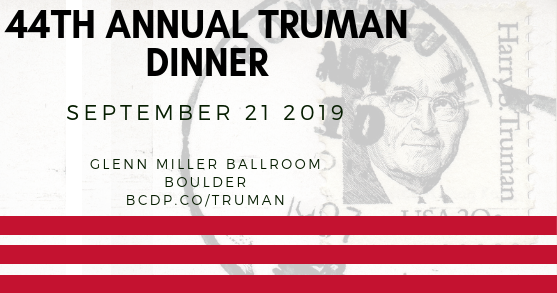 The 2019 Truman Dinner will be on September 21st, 2019. Last year's Truman Dinner was enjoyed by 360 attendees, 65 VIP reception participants, 25 scholarship recipients, and 10 sponsors. We can't wait to top it this year as we build a powerful party that engages voters around the county ahead of the 2020 presidential election! Check back here for updates, to buy tickets, and to learn who our speaker will be in 2019!